When I was three or four, I had a picture book about a princess with pink high heels and I never forgot that shade of pink. Even now when I see that particular hue, I think of the princess with the pink high heels. Like hundreds of other kids, I wanted to go to OZ; I wanted a closely-knit family like Betsy in the Betsy-Tacy books; I wanted to find a penny that would grant my wishes – even half a wish, like the kids in Edward Eager's Half Magic. In 1972, when I was a young adult, my house burned down and I lost all my childhood and adolescent poems, journals, and stories. My beloved childhood china doll, Rosmyrelda, also perished in the blaze. 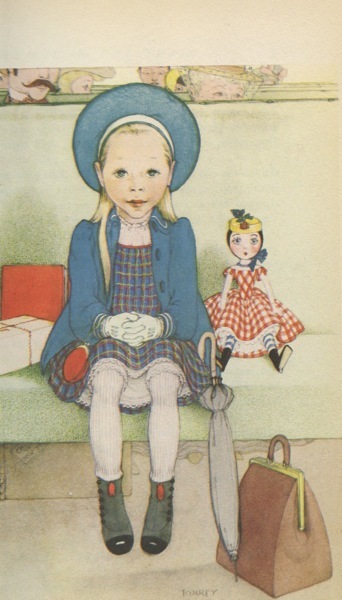 Rosmyrelda was named after a doll in a book I'd read as a child about a little girl taking a train trip with her favorite doll, Rosmyrelda. After the fire, I searched and searched for the book which I remembered being called simply Rosmyrelda. But I had no luck finding it. In 1990, I published my second book for children, a middlegrade novel entitled Just Plain Penny. Shortly after the book came out, I heard from a rare book dealer who had finally found the book I'd been searching for. But as it turned out, the book wasn't named after the doll, but after the little girl. And her name? Penny! My own Rosmyrelda was gone, but a book lost in time had come home to me. The stories find us; we find the stories.